For the uninitiated reader, any story about Lviv must begin with an important caveat: it is one of the most paradoxical places in Ukraine. On the western edge of the country, its people’s heads are full of unresolved contradictions. Behind the facade of an exemplary post-Soviet, pro-European city lies a reality tacked together from shreds and patches. It is a looking-glass land where nothing is simple. A web of invisible borders divides not only its various population groups, but the consciousness of each inhabitant. Perhaps that is why people are so intent on constructing coherent images and stereotypes for themselves – the exemplary patriot, the exemplary European, the exemplary Ukrainian. But there is no more complex place in the country than Lviv. All this leads us to the question of Russian culture here – a much less alien presence than people tend to imagine. Tourists visiting Lviv from Russia or Russian-speaking parts of Ukraine are generally surprised to find themselves welcomed by the locals, whom they have always seen as rabid nationalists. But there is nothing surprising about it: Lviv’s people are used to the language, which has always been heard and is still heard on every street, although it is true that “ancient Lviv traditions” were reinvented at the time of perestroika and are still being reinvented in the public space, with restaurants, for example, being rebranded with Ukrainian-sounding names. All these Ukrainian names, including the name of the city itself, were only adopted after the Soviet annexation, firstly after the Nazi-Soviet partition of Poland in 1939, and then following the Soviet reconquest of Ukraine after 1945. From 1918 until 1939, it was under Polish rule and called Lwów. Earlier, it was Lemberg under the Austro-Hungarian Empire, and in Russian it is known as Lvov. In 1945, the city lost most of its previous inhabitants with the redrawing of borders and an effectively new, Soviet city came into being. After Stalin’s troops took it for the second time in August 1944, Russian culture, in its Soviet incarnation, dominated here for many years. Lviv was mostly resettled by people from further east, and with time became an industrial centre that swallowed up hundreds of thousands of Ukrainians from surrounding villages, although what they found themselves part of was a fully fledged socialist and Russified culture. The historic city of Lviv, western Ukraine, 2014. Photo CC: June DC / Flickr. Some rights reserved.After the demise of the USSR, the city’s residents almost unanimously rejected their Soviet roots and began to create a new, Ukrainian Lviv. But their everyday lives, including their cultural lives, were still defined by old Soviet practices and habits. Despite their ostentatious patriotism, most locals can’t imagine their lives without the habitual elements of Russian mass culture. “Why do our minibus drivers go on listening to classic Russian chansons?” ask the city’s so-called professional Ukrainians, the driving force behind promoting Ukrainian culture. All they can do is shake their fists at the Soviet legacy that means full houses for concerts by popular singer Gregory Leps (who is in fact of Georgian extraction) or the heavy metal band Aria. The PR people of one of the city’s mayoral candidates dreamed up the slogan “There are two Lvivs”, which is now heard everywhere, although admittedly usually with a semi-ironic lilt, to remind people of the difference between “cultured” Lvivians and “uncultured” yobs; between the rich and the poor and between the “progressives” and the “old guard”. But it could equally be applied to the “Ukrainian” and “Russian” Lvivs, whose mutual antipathy is still strong. The annexation of Crimea and the war in eastern Ukraine that followed could not help but affect locals’ cultural habits, albeit less strongly than it might appear. Naturally, Russia’s cultural “product” is less welcome than before and there has been a spontaneous rejection of anything to do with Russian officialdom. The figure of Putin has become a real taboo, often literally so. Poet Grigoriy Semenchuk, former director of the international literary festival run by the Lviv Publishers’ Forum, describes a telling incident at the 2014 Leipzig Book Fair, when a Russian representative approached the Lviv delegation and suggested a collaboration between them. The Lviv group made this conditional on the removal of the portrait of Putin on the Russian stand, and there the talks ended. Official cultural exchanges between Lviv and Russia have more or less come to a halt; no one wants anything to do with the aggressor state. This is clear from the posters displayed on the city’s cultural venues. Taras Grudovoi, the director of the Lviv Philharmonic concert hall, has said that he is not pursuing any special anti-Russian policy. The world famous Russian pianist Andrei Gavrilov has played here many times, the last being a few weeks ago, in the middle of March. The only people under a total ban are those on one of the blacklists drawn up by the Ukrainian Ministry of Culture, including the celebrated viola player Yury Bashmet, who actually grew up in Lviv and used to play here regularly. Now it is not only blacklists that prevent Russians performing at the Philharmonic, but also a lack of resources. The Russian Consulate in Lviv used to subsidise artists’ performances here, but now such cooperation is completely out of the question, and concert promoters try to attract western musicians instead. The taboo on official contacts has also diminished the Russian presence at important cultural events, such as the Lviv Publishers’ Forum. As Aleksandra Koval, the Forum’s director, told me, Russian publishers used to present their books at a special guest stand provided by the Russian government. But after the annexation of Crimea, the Forum rejected this arrangement and now Russian booksellers can only come if they are prepared to finance themselves. Some still do, including the well known novelist Lyudmila Ulitskaya, who visited Lviv two years ago. However, says Aleksandra Koval, the Forum was never very popular among Russian publishers. But she is still hoping for some literary collaboration with Russians: as she says, “there are a lot more clever and interesting people in Russia than people in Lviv think, and we need to keep up contact with them”. Despite the break in official relations, no one is talking about a complete rejection of Russian culture in Lviv. Local promoters call their new approach “the popularisation of a high quality product, preferably Ukrainian”. This allows any rejection of Russian mass culture to be put down to its low quality. And it isn’t just an excuse. The Dikart agency, which organised Grigory Leps’ visit here a few years ago, would not bother with him now. But Dikart’s manager Olga Misan-Milasevich told me with pride that they had two full houses for a gig by rock musician Andrei Makarevich last autumn. Kyiv’s concert agencies are making a big effort to fill the large gap in schedules that has appeared since the disappearance of Russian artists. Lviv’s opera theatre will soon welcome the singer Laima Vaikule, whose publicity posters proclaim her to be a Latvian star, and make no mention of her former fame as a popular Soviet entertainer. Kyiv was probably behind the appearance in Lviv of rap-guru Guf, who performed in February at the city’s premier venue, the Event Hall Kino Club. So show business here is alive and well and showcasing Russian artists – so long as they get through the “complicity with the Putin regime” test. Those who want to organise gigs by acceptable Russian musicians do however face a moral dilemma. Playing in Lviv doesn’t do well known acts any good at home. Matviichuk has heard that Noize MC has experienced problems since he headlined at their festival. He doesn’t know whether he should go on hiring Russian musicians if it puts them under pressure at home. Diana Gaivoroniuk, a DJ at FM Galichina who has worked at many of Lviv’s radio stations agrees with Katya. She has always tried to avoid playing Russian music on air, since “Lviv is an especially patriotic region, and its radio stations should be special as well”. But as she points out, the problem is not just radio stations from outside the region, but local ones that are not particularly sound on patriotic issues: “Not many people realise that even now, with a war on, there are musicians here in Lviv who perform in Russian and Crimea, for money”. She won’t give any names, but adds that they are “pretty famous and vociferous singers who shamelessly post photos of themselves taken in the Kremlin or Crimea on social media”. The airwaves would seem to represent an ideal way of supplying a demand for Russian cultural products among people in Lviv. Music, after all, is better than any other “product” at crossing borders and narrowing the distance between a studio in Russia and a cabbie’s ears. The situation with books is similar, but only in broad terms. Local publishers and booksellers try to promote Ukrainian books,, while booksellers elsewhere offer the public both books written and produced in Russia and local Russian-language works. However, it has been more difficult to provide the residents of Lviv with Russian bestsellers than Russian pop. Detective stories by Darya Dontsova and Aleksandra Marinina used to be able to compete in price with Ukrainian books not only because of the high VAT rate on books produced in Ukraine, but also thanks to well-oiled contraband operations. Now, as every bookseller in Lviv has told me (anonymously), it has become much harder to smuggle literature across the border from Russia. 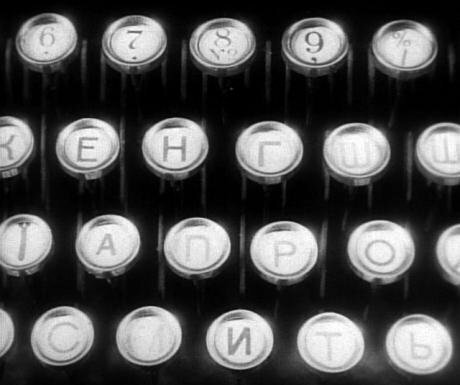 Ukrainian-language keyboard, from Dziga Vertov’s 1929 film ”Man with a Movie Camera”. Photo CC: BSWise / Flickr. Some rights reserved.“We already have a situation where it’s cheaper to print books in Ukraine than to import them from Russia”, says Liubov Lashnevskaya, manager of the Dim Knigi bookshop. “We import very little now, and mainly sell off the last odds and ends at a discount. In fact customers very rarely ask about Russian books: they’re more interested in Ukrainian ones. And a lot of publishers have started bringing out titles in both languages at the same time”. The Lviv branch of the E bookshop chain has also stopped ordering Russian books, and is just selling off the last copies. “Once the warehouses are empty, we’ll just reprint classics”, shop manager Galina Lavrys tells me. “There has always been a demand for those, and that will continue”. Man and woman do not live by popular culture alone. Lviv’s artists and cultural activists are setting up their own connections with Russia, in parallel to the mass market. While the average Lviv resident considers whether to stop listening to Russian pop, independent artists are trying to maintain their existing contacts with Russians. These contacts have been widest among literary people, thanks to Lviv’s international literary festival, which takes place annually under the aegis of its Publishers’ Forum. Poet Grigoriy Semenchuk, who until recently was the festival’s director, says the largest group of people visiting the festival were always Russian writers. Since 2014 this group has thinned out. “The world”, begins Grigoriy, “has suddenly split, but not so much into Ukrainians and Russians as into ‘us’ and ‘them’. The Slovak writer Valery Kupka, for example, used to be a frequent visitor to Lviv, but at the time of the annexation of Crimea he spoke on TV in support of Putin. So now he’s one of ‘them’, as is the literary authority and critic Dmitry Bak, who was born in Lviv and had very good relations with the city and its people until he signed an open letter to the Russian president in support of the annexation”. Most of Grigoriy’s contacts who fell away were older writers with a certain position in society. “But I haven’t become disillusioned with my fellow literary people in general”, he tells me. Another bastion of independent culture in Lviv is the Dziga club-café, where the glasses are filled by Markian Ivashchishchin, a cult figure in the city’s underground who at the time of perestroika was an active member of the movement for an independent Ukraine and the creation of a new, Ukrainian Lviv. Events in Crimea have not changed much in Dziga’s artistic community. As Yurko Vovkogon, the coordinator of local cultural events here, tells me, “there were never many Russians here, and there are still not many. All I can remember is that various jazz musicians would come to our Dzhaz Bez festival from all over, and some of them were Russians”. Yurko returned from the front in Donbas just a few months ago. Perhaps that’s why he doesn’t want to talk about Russians. Dziga’s cultural politics are the most consistent expression of the general rule followed by Lviv’s cultural organisers: “we promote Ukrainian music first of all, and then high quality music in general”. The only difference is that here, this was the central principle all along. Yurko puts the band Leningrad’s frontman Sergei Shnurov forward as an example of “high quality music”. In May, Dziga will organise another one of its festivals, The Weather Vanes of Lviv, where one of the groups performing will be a Polish theatre from Wrocław, this year’s European Culture Capital, which has asked Lviv to be its partner. The Wrocław group will perform a show about the “philosophy of binge-drinking”, compiled from lyrics from Leningrad’s songs. “We’re in talks with Shnurov about permission to put the show on in Lviv. Maybe he could call by on his way to Poland”, says Yurko. And adds: “As for Russians… the only thing we won’t accept is Russian language Ukrainian culture”. Literary figures from Russia and Lviv had a good chance to get together last autumn, when a discussion billed as “beyond propaganda” took place as part of the WARNING! media-art exhibition. The discussion, which involved visiting Russian artists such as Yelena Romenkova, Mikhail Maksimov and Aristarkh Chernishev, made it clear that although Ukrainians and Russians might not agree on some social and political issues, dialogue was possible. Afterwards, Maksimov admitted that meeting with Ukrainian colleagues had changed his attitude to politics as an artist. Lviv media artist Andrei Linik, who also showed work at WARNING! has long been in touch with Russian colleagues, and last year organised a visit to Lviv by the Kaliningrad artist and curator Dmitry Bulatov. “In fact all my Russian friends supported us both at during the Maidan and after Crimea”, he says. “There was only one person who refused to talk to me during that period”. It’s not so easy to get to Lviv now. Russians can be delayed for hours at airports, and it’s harder to organise travel without official financial support: Andrei can’t just contact the Russian consulate any more. “To be honest”, he says, “Vyacheslav Kirilenko, our Ukrainian Minister of Culture is a bigger headache than the Russian Defence Minister Sergei Shoigu”. There is no crisis on the indie music scene. Lyana Mitsko, artistic director of Lviv’s Underground club tells me that, “young alternative musicians are keener to come to Lviv now than they were before”. Once people come, they always want to come again: they love the audience and the reception they get here. The only obstacle is Russians’ mistaken ideas about the situation in Ukraine. Lyana remembers one guy whose mother wouldn’t let him go to Lviv, convinced that there were artillery battles happening on the streets. On the alternative music scene, nobody cares which musicians come from Russia and which from Ukraine – Lyana assures me they all get the same audiences, “although we don’t book any rabid nationalist types anyway”. Each of Lviv’s cultural scenes, whether market-led or indie, has come to its own conclusions about Russians, but the future of the city’s Russian Cultural Centre (RCC) could potentially turn the issue into a matter for open public discussion. The centre opened in 1996, and for many years it was the only institution of its kind in Ukraine. It is home to various amateur musical and theatrical societies and is also used by a number of groups such as the Cossack community and a military history club. Although the centre’s users keep an extensive record of all the attacks on the building by Ukrainian nationalists, Lviv’s residents are barely aware of its existence. It was only mentioned in the local press in 2014 after a fire, and now again when its very existence is under threat. 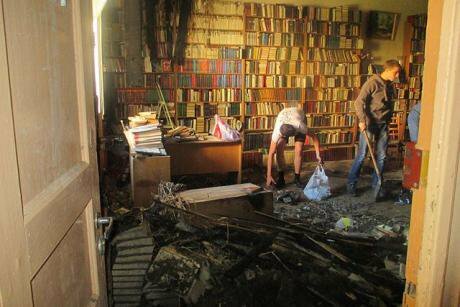 Library of Lviv’s Russian Cultural Centre after a fire in May 2014. Photo CC: Alfa Nord / Wikimedia Commons. Some rights reserved.The regional Council of Deputies has decided to repossess the building, using the formal excuse that it is not occupied by the organisation they originally signed an agreement with. The centre’s user groups are up in arms, calling the decision politically motivated. The more likely scenario is that the centre has become a victim of the regional government’s “new economic policy”. For instance, they have just repossessed the building that housed the city’s film distribution office, which has now closed down. In any case, no one has noticed what is happening to the RCC – locals are completely indifferent to its fate. This is partly due to the centre’s own closed door policy – in its 20 years of operation its management showed an almost sectarian unwillingness to establish any outside contacts. But what really sparked a real storm of controversy last year was the Alfa Jazz Fest. This event, one of Europe’s biggest jazz festivals, was founded in 2011 by Russian billionaire oligarch Mikhail Fridman, a native of Lviv. It has always booked world class jazz artists and attracts a multinational audience of fat cats to the city. Last year the festival coincided with the peak of violence in Donbas, and many well known Lviv journalists and campaigners suddenly remembered that Fridman is a Russian banker who pays his taxes to Russia’s exchequer which, in turn finances military supplies to Donetsk. 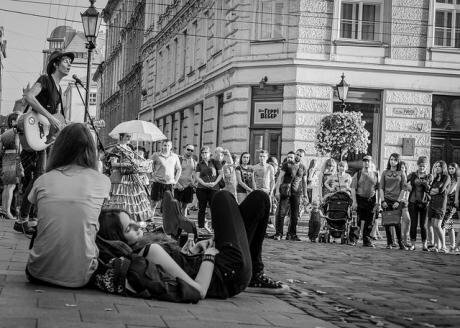 Alfa Jazz broke Lviv’s central taboo – complicity with the Russian state. 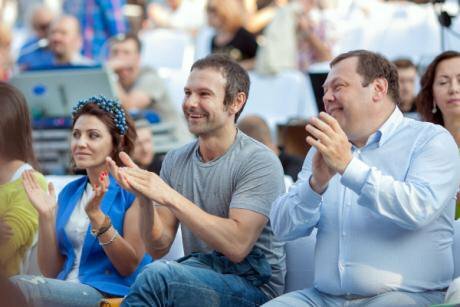 Ukrainian rock musician Svatoslav Vakarchuk (centre) with his wife and a representative of the Alfa-Group consortium Mikhail Fridman (right), at the Alfa Jazz festival in Lviv. Photo (c): Taras Chaykivsky / visual RIAN. All rights reserved.An open discussion was organised, with civil society campaigners, representatives of the municipal authorities and festival organisers all taking part. Some participants demanded the cancellation of a festival funded by “enemy cash”. Others argued that politics and culture are different things. It ended in a compromise: the festival went ahead but without any advertising for its Russian bank sponsors. This solution, of course, satisfied neither side, and the question of how far Lviv’s citizens were prepared to make peace remained unanswered. Both of these issues – the RCC and Alfa Jazz – have shown how difficult it is to produce a clear picture of Lviv’s cultural links with Russia. And this was as true of the “pre-Crimea” period as it is today. The city’s multilayered past still keeps its people floundering between old wounds, real customs and new aspirations. On the other hand, the lack of a defined mindset is not necessarily a bad thing. 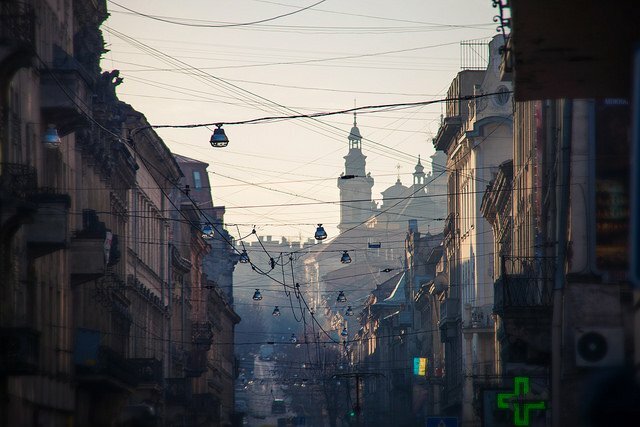 Lviv’s looking glass leaves room for the development of real relationships that wouldn’t fit into a tighter framework.